Advent Laser Optical/Contact Tachometers Reliability Direct, Inc. Your Direct Source for Reliability, Maintenance, Test & Measurement! ET-2109 explosion proof tachometer is certified EEx ia IIC T4 - ATEX II 2 G to allow for use in a wide range of hazardous environments including petrochemical, Gas & volatile materials processing industries. The ET-2109LSR is not certified for use in Mines. 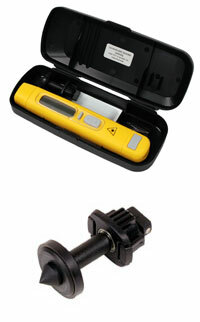 The ET-2109 is supplied as a complete kit with the tachometer, reflective tape, contact adapter, calibration certificate, instruction manual, 4xAAA batteries all in a hard plastic carrying case.